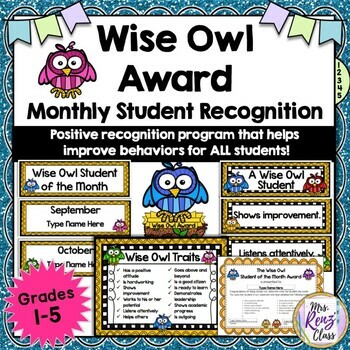 The Wise Owl Student of the Month is an effective behavior program designed to recognize and improve behaviors for ALL students. 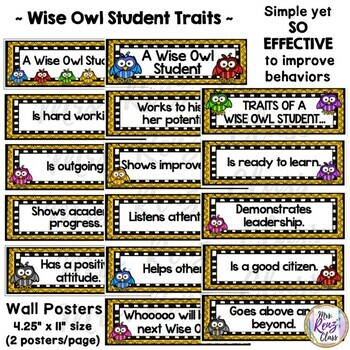 There are 12 "Wise Owl Traits" that focus on traits that help students become successful learners. Some students always get recognition and some students seldom or rarely do. This program allows you to focus on one or more of the traits and recognize the hard work and effort that students are making. 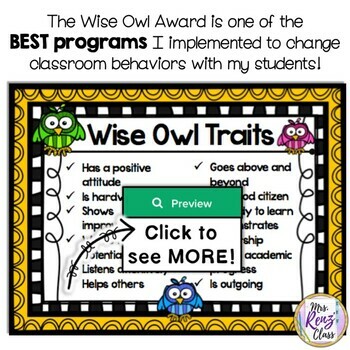 This SIMPLE to use program has changed behaviors and I can't imagine teaching without this program! This set includes 78 pages of everything you need to implement this program today. 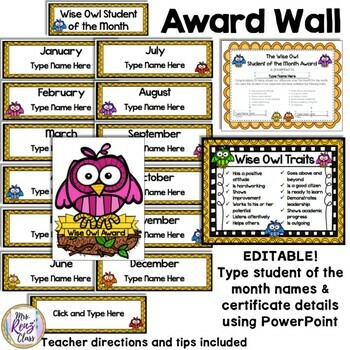 Included are all bulletin board wall posters, student letters, award certificates, and all of the hints and tips needed. The materials are in editable PowerPoint format plus, MS Word format and PDF. Just put up the bulletin board display and focus on the Wise Owl Traits then select a student of the month! Type the name into the editable certificate and bulletin board month winner poster. See the visual preview to see all of the materials included.